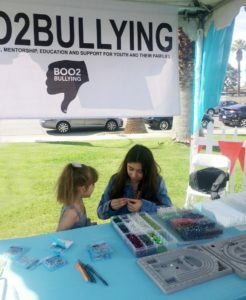 Hello, my name is Mia Velarde I am the Young Girls Outreach Ambassador for Boo2Bullying. I am 13 years old and finishing my last year of Middle School. My start in 8thgrade was rough the first week into the New School year, I was surrounded by my peers and threatened physical harm. I have never had any issues and no problems leading up to this event. My days that followed grew even more difficult as I was just tormented by a group of individuals on a daily basis. I faced belittling, mocking, threats and most recently being choked on school campus almost to the point of losing consciousness. As a growing teen I wondered what I am doing wrong, Why Me? This situation only fell on silent ears with my administration and school district, they allowed me to become a target a “Victim” for others to continue the harassment. I am standing up, fighting back, making my voice heard. 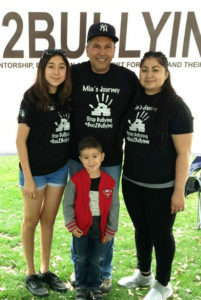 I have gone through this and by doing so I have become an Advocate to stand up and fight against bullying. I would like others to know that bullying is serious and never be scared to reach out and tell others. Make your voice heard do not allow others to silence you and dismantle your self-confidence. 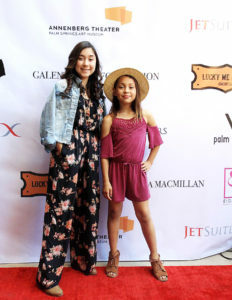 (left to right) Mia & MaleahAnn Ibarra Desert’s Got Talent 2018, Annenberg Theater, Palm Springs |Boo2Bullying Community Outreach, Loma Linda Children’s Hospital Indio Campus, March 2018 | Mia, President & Founder Boo2Bullying, Dimitri Halkidis & Mayra Velarde, Field Day Palm Desert Civic Center Park.